Orangutans are the only one of the great apes found outside Africa (aside from humans). In the past they were found throughout southern Asia but are now restricted to the islands of Borneo and Sumatra with distinct species on each. Widespread destruction of their habitat in recent years (particularly with the spread of palm oil plantations) has seen the numbers of orangutans decimated. There are likely to be less than 20,000 left in the wild, with the Bornean orangutan listed as endangered and the Sumatran orangutan now critically endangered. Orangutans are one of the most iconic and admired species in the world and an encounter with these beautiful and intelligent creatures is a highlight of any trip to Borneo or Sumatra. The decreasing orangutan numbers, the dense rainforest foliage and their solitary nature makes it very difficult to see orangutans in the wild, but you may be lucky enough to spot one on guided treks through the rainforest. The best chance of seeing orangutans however is at rehabilitation centres such as Semenggoh in Sarawak and Sepilok in Sabah � here animals rescued from logging sites are rehabilitated and prepared for release back into the wild. Like Sepilok in Sabah, Semenggoh Orangutan Centre near Kuching in Sarawak helps to rehabilitate injured and orphaned orangutans before releasing them into the wild. Massive destruction of their habitat in recent years with the spread of palm oil plantations has had a devastating effect on orangutan numbers and centres like these are helping to preserve this beautiful and intelligent creature, the only great ape found outside Africa. 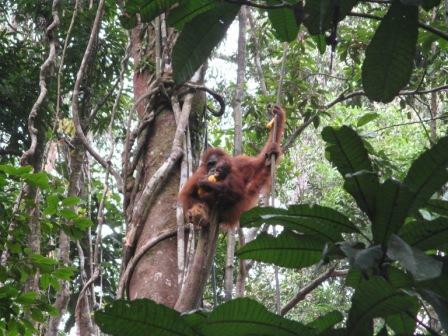 At Semenggoh, you can watch semi-wild orangutans come out of the forest during feeding time, perhaps your best opportunity to see these amazing animals. 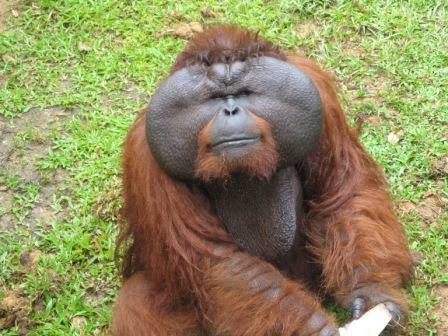 Sepilok Orangutan Rehabilitation Centre was set up in 1964 and covers over 4,000 hectares. It is one of only three orangutan sanctuaries in the world, designed to rehabilitate injured and orphaned orangutans and teach them the skills required for them to survive in the wild. There has been massive destruction of the rainforests of Borneo and Sumatra in recent years to make way for palm oil plantations and this has had a devastating effect on orangutan habitat and numbers. Orangutans are the only great ape found outside Africa and are beautiful and intelligent creatures who captivate all those who see them. 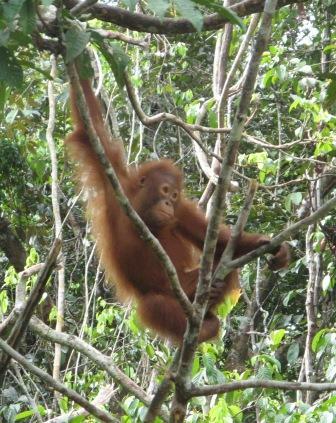 Being solitary and shy animals, it is very difficult to spot orangutans in the wild, so centres like Sepilok offer a great opportunity to see these apes swinging through the trees at feeding time. 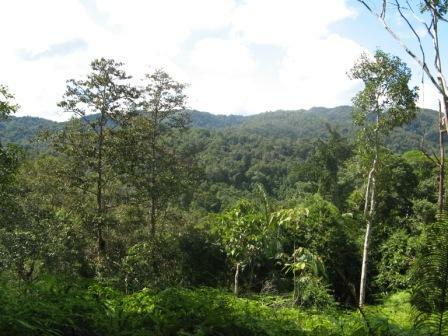 The Tropical Rainforest Heritage of Sumatra comprises three national parks spread throughout the island - Gunung Leuser National Park, Kerinci Seblat National Park and Bukit Barisan Selatan National Park, totalling 25,000 km². The highest volcano in Indonesia and highest peak in Sumatra, Gunung Kerinci at 3,805 metres, is located in Kerinci Seblat National Park. The parks are key to the conservation of the biodiversity of Sumatra and its endangered species, particularly the Sumatran orangutan. They are home to some 10,000 plant species, 580 bird species and 465 mammalian species, of which 22 are Asian and 15 endemic to Indonesia. 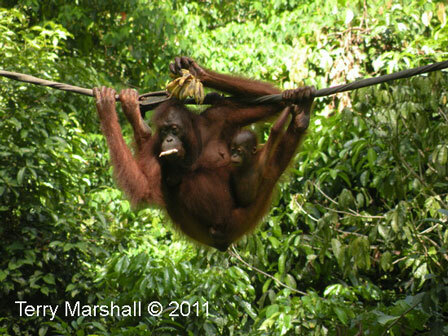 Organised group tours: Click here to see 4 tours to Borneo which may include Orangutans.